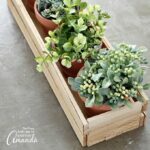 You won’t believe how easy it is to make this wood shim planter box, no power tools required! Leave this project bare wood or paint it any color you like. Wood shims – they come in two sizes at your local home improvement store. Buy the long ones. Start by measuring your small terracotta pots. Keep in mind the width of the tops and the height of the pots, so your planter box has the right dimensions. Build the base and the walls of your box. Important: This base was three wood shims wide, but I used six wood shims. Each wall was two wood shims tall, but I used four wood shims. This means that you will have to double up your wood shims. Since each wood shim has a thick and a thin end, stack two wood shims at a time. Secure two wood shims together at a time using both a dab of hot glue at each end as well as E6000. The hot glue provides instant adhesion while you work, but the E6000 will give you better, long-lasting results. Cut down the thick end of four wood shims to serve at the short walls of the planter. Secure all of the walls using both types of glue. Add a dab of hot glue on each end, and then fill in the middle of each wood shim with E6000. Wait 24 hours for the E6000 to fully dry. This project for DIY Wood Shim Planter Box was printed from CraftsbyAmanda.com - https://craftsbyamanda.com/wooden-planter-box/ and can only be printed for education or personal use.